Darien's Owen Stevens holds a pike in mid air at the John Smith AAU Red White Blue National Qualifying meet in Rockville, Maryland on March 30, 2015. Stevens medaled in all four events. Fifteen divers from New Canaan YMCA's Whirlwind Diving Team traveled to the Kennedy Shriver Aquatic Center in Rockville, MD where they competed in the John Smith AAU Red White Blue National Qualifying meet. There were 210 divers from 19 teams from the North East and Mid-Atlantic that traveled for the three day event. The top six finishers from both the 1-meter and 3-meter springboard events earned a spot at the AAU Nationals meet to be held in Coral Springs, FL in late May. All 15 Whirlwind divers competing earned points for the team's third place finish, with 10 team members qualifying for the national event. The top six divers in each event (1M, 3M, Synchronized Diving, and Platform) were awarded medals, and the Whirlwind divers captured 29 medals during the event. 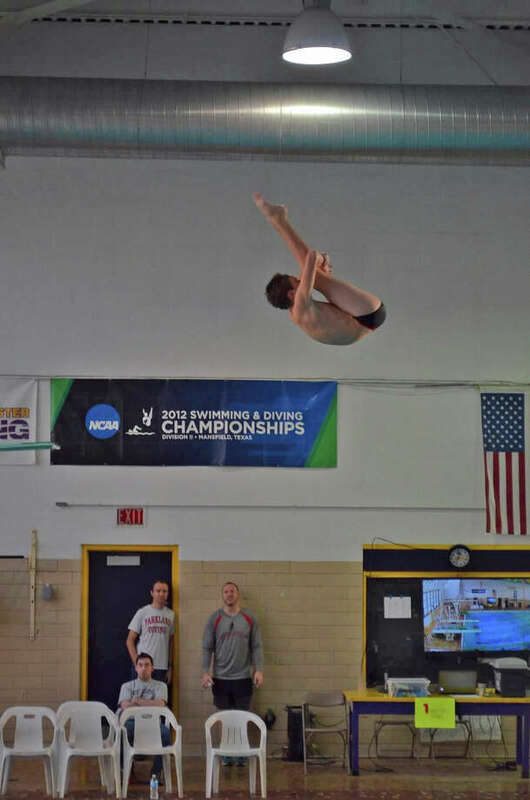 Owen Stevens (Darien, 14-15 age group) was the only Whirlwind diver to medal in all 4 events. Triple medal winners included; Kevin Bradley (Norwalk, 14-15 age group), Lee Christensen (Darien, 18-19 age group), and Kylie Tobin (New Canaan, 18-19 age group). Double medal winners were Andrew Bologna (Greenwich, 18-19 age group), Rachel Burston (Stamford, 16-17 age group), Anne Farley (New Canaan, 15-16 age group), Timmy Luz (Darien, 16-17 age group), Kyle O'Donnell (Darien, 18-19 Age group), Kirsten Parkinson (Stamford, 18-19 Age group), and Wiley Schmidt (Darien, 14-15 age group). Single medal winners were Cameron Rhind (New Canaan, 16-17 age group) and Claire Ross (New Canaan, 14-15 age group). Allison Courtney (Wilton, 16-17 age group) and Griffin Edmonds (New Canaan, 16-17 age group) also contributed to the team's points, finishing in the top 12 in two events each. A special congratulation to the gold medal winners: Tobin (3M and Platform), Christensen (1M and Platform) and Burston (3M). Whirlwind's next meet will be the Summer National's Regional Meet to be held in Purchase, NY on Apr. 24-26.